What would you do if your Halloween costume granted you special powers? Skully has been getting so excited for Halloween 2017 he has been getting up to a spot of mischief with his new invisible cape costume! When Skully puts on his cape, he becomes invisible to the world and has been playing little tricks and escaping the scene of the prank undetected! Hands Up For Sneaky Halloween Pranks! Skully’s first stop was to his local shopping mall. 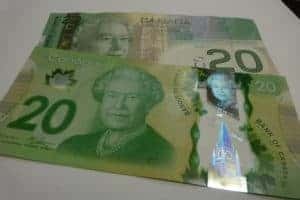 He stuck some dental floss to a couple of $20 bills and left them on the floor. As passers by went to pick up the money, he would pull on the dental floss so that people couldn’t pick up the money. Sneaky Skully! Next stop on Skully’s day in his invisible costume was to the cafe where his friend works. Just before his friend went to sit down for his break, Skully hid himself on the chair and as soon as his friend sat on him – BOO! He gave him the fright of his life. Skully couldn’t go a day being invisible without tricking us at Halloween Alley HQ. 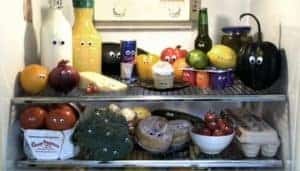 He somehow managed to sneak into our office kitchen and stick these eyes on the contents of our fridge. We couldn’t be mad at Skully for this though, I mean, who’d have thought an onion could look this cute! We all know the fury you feel when somebody decides to flush the toilet whilst you’re in the shower! 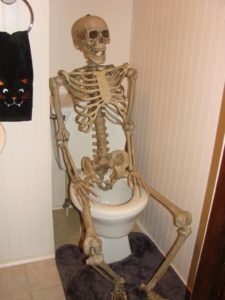 Skully did this to his roommate. Don’t worry, they’re friends again now. You’ll be glad to hear, we’ve taken Skully’s cape away from him. 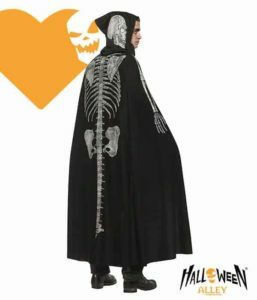 We’re giving you the chance to win this very skeleton cape to add to your Halloween costume collection. All you need to do is visit your local halloween store this Saturday, September 16 for our first in-store event. If you win the cape, we can’t condone you copying Skully’s antics – but if you do, tweet us your photos!